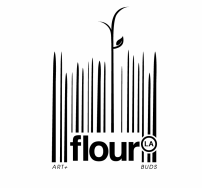 One of our most fun services, Flour LA creates floral art for events, openings, and commissioned floral installations. We can create any logo in flowers, and love a challenge. Custom flower clothes in floral couture featuring fake and real flowers for clothing and dresses. There's nothing too small or too big that we can't handle. Whether it's a hanging backdrop, step and repeat, or gala, our floral design consistently provides high-end style and service in both our Los Angeles florist and New York florist studio locations. We love creating flower backdrops and walls, hanging flowers from ceilings, and can cover nearly anything in flowers. Our custom fake flower clothes have been featured in Patricia Field's flagship store in NYC.